When ordering just one remarque, indicate your choice of "von Richthofen" or "Aussie Gunners" in the comments box during checkout. Manfred von Richthofen, the highest scoring ace of the First World War, was brought down on April 21, 1918, most likely by Australian gunners. 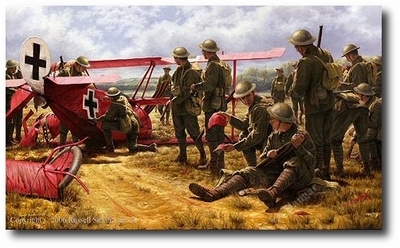 After the crash, MvR's body was removed and his famous all-red triplane, number 425/17, was immediately set upon by souvenir hunters. Many of those souvenirs still exist today.